1 of 4 Mix together the flour, sugar and salt in medium-size bowl until well blended. Using pastry blender or 2 knives, cut the shortening into flour mixture until coarse crumbs form. Gradually add the cold water, tossing with a fork until the mixture begins to come together. With your hands, shape pastry into a ball. 2 of 4 Roll the pastry out on a lightly floured surface into 13-inch circle. Roll the pastry up on the rolling pin; unroll into 9-inch pie plate. Gently fit the pastry into the pie plate, being careful not to stretch the pastry. Roll the edge of the pastry under to form a stand-up edge; with your fingers, flute edge. Place crust in refrigerator for 30 minutes to chill. 3 of 4 To bake crust, heat oven to 425 degree F. Remove pie plate from refrigerator. Prick pastry all over with a fork. Line pastry shell with aluminum foil; fill with dried beans, rice or pie weights. 4 of 4 Bake pastry in 425 degree F oven for 15 minutes. Carefully remove the aluminum foil with the beans. Continue to bake the crust for 8 to 10 minutes or until the edge of the crust is golden brown. Let cool while preparing filling. 1 of 4 Heat chocolate and 1/2 cup milk in small, heavy saucepan over low heat, stirring constantly, until chocolate melts. Combine sugar, cornstarch and salt in large saucepan. Gradually stir in remaining 3-1/2 cups milk until completely smooth. Stir in chocolate mixture. 2 of 4 Cook the chocolate mixture over medium heat, stirring constantly, until the mixture is thickened and begins to bubble, 15 to 20 minutes; then continue to cook for another 2 to 3 minutes, stirring constantly. Remove the saucepan from the heat. 3 of 4 Using a fork, beat yolks slightly in a small bowl. Stir 1/2 cup of the hot chocolate mixture into the yolks. Stir the yolk mixture into the chocolate mixture in the saucepan; cook over low heat, stirring constantly, for 1 minute (do not overcook or the eggs will begin to set up). Stir in the vanilla. 4 of 4 Pour the filling into the cooled pastry shell. Place a sheet of plastic wrap directly on the surface of the filling. Refrigerate the pie for 3 hours or until thoroughly chilled. 1 of 1 Just before serving, beat together the heavy cream, confectioners sugar and vanilla in a small bowl until stiff peaks form. 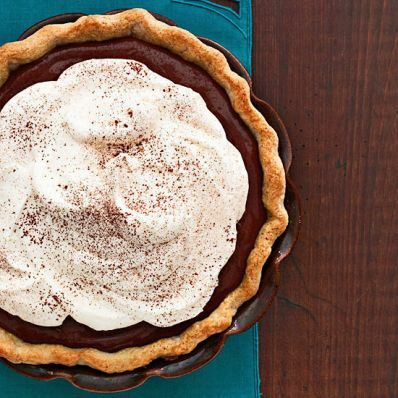 Spread the topping evenly over the surface of the pie. Serve immediately or refrigerate until ready to serve. Per Serving: 2 g fiber, 362 mg sodium, 64 g carb., 38 g Fat, total, 185 mg chol., 19 g sat. fat, 611 kcal cal., 8 g pro.